Esteban Guzman says he can take all the derogatory terms anyone throws at him. But when the hatred is directed at his mother, that's another story. The Latino man said he was working a landscaping job with his mother on Saturday in Running Springs, about 80 miles east of Los Angeles, when a white woman approached them and began berating her, telling Guzman's mom to "go back to Mexico." 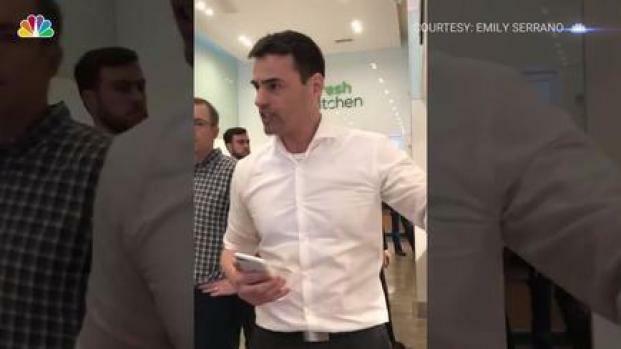 Guzman, a U.S. citizen, said he stepped in to confront the woman, who then extended her middle finger in his face and lashed out in a racist rant. Guzman's mother, who had been using a leaf blower to clear the driveway, caught the exchange on video outside a residence in the San Bernardino County community. He can be heard asking the woman, "Why do you hate us?" Guzman told the unidentified woman that he and his family are honest people. The woman laughed and said, "Yeah, rapists. Drug dealers, rapists and animals." The language is similar to that used by President Donald Trump when he announced his campaign in June 2015. "When Mexico sends its people, they're not sending the best. They're not sending you, they're sending people that have lots of problems and they're bringing those problems," Trump said in a speech at Trump Tower in New York. "They're bringing drugs, they're bringing crime. They're rapists and some, I assume, are good people, but I speak to border guards and they're telling us what we're getting." Guzman, a 27-year-old systems administrator and graduate of Cal State Polytechnic University-Pomona, spoke with NBC4 on Monday. "I was born and raised here in California, and we're just trying to do good," said Guzman, of Pomona, who has a landscaping service with his brother. "I felt angry, and I felt scared. I thought she was going to call the police and, you know, we'd have to deal with that." The woman's initial comments directed at Guzman's mother were not captured on video. Guzman said he does not know the woman and has no idea why she targeted his family. Video of the verbal exchange had more than 260,000 views on his Facebook page by Tuesday morning after it was posted Saturday. "My mom taught me to be respectful to people, no matter what," Guzman said. NBC4 is attempting to identify and contact the woman seen in the video for comment.